Tetanus occurs in all countries in the world. It is agonizing. It can be fatal. It causes muscles to contract so strongly and relentlessly that bones can break. If you get it badly, the only way to try and keep you alive is to give you a general anaesthetic (induced coma), put you on a ventilator, and keep you that way until the disease has run its course. This usually involves many weeks so a tracheotomy is often required. (A tracheotomy is where a cut is made in the front of the neck, and a tube placed directly into the airway through that hole. You are then ventilated via the tube). There is no specific treatment that will ‘cure’ it once it has taken hold, which is why prevention is so important. In this picture, muscle spasms have caused this man to be bent backwards, and he has an abnormal facial grimace happens as his facial muscles cramp. Click here to read the Williams’ story about how tetanus affected their son Alijah. 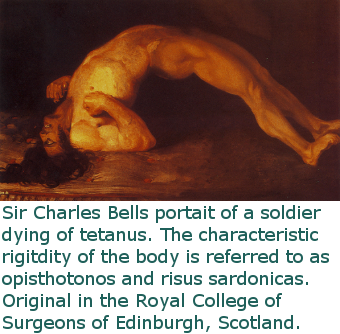 Tetanus is the disease caused by the bacterium Clostridium tetani. Clostridium tetani is an anaerobic bacterium — which means it needs an oxygen free environment to multiply and thrive. It also produces spores, which can survive in many different conditions, ready to reproduce once the environment is more favourable. It lives in the ground/soil/manure, is endemic (widespread) in Australia and throughout the world. The disease is caused by a toxin released by the bacteria as it undergoes cell lysis (cell death and breakdown). It doesn’t matter whether the wound is aerobic or anaerobic — any wound (whether bleeding or not) can be contaminated with the bacteria. The toxin is so potent the bacteria do not need to be happy and multiplying to cause disease — just a few bugs undergoing cell lysis (cell death) can release their toxin and cause tetanus. Cleaning the wound may clear most of the bacteria, and it is important that this is done. Copious amounts of sterile water or normal saline is recommended as using detergents or agents such as hydrogen peroxide can damage healthy tissue and delay wound healing. 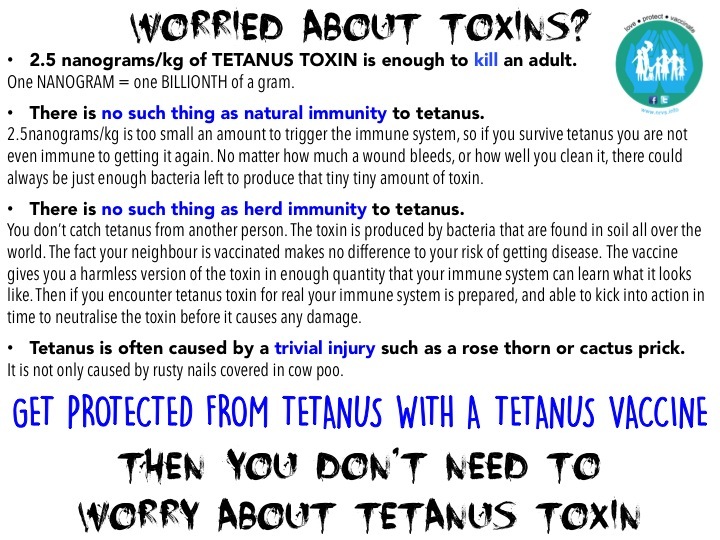 Tetanus immunity means that the immune system is primed and ready to ‘neutralise’ the toxin. Immunity has no affect on the bacteria directly, as it is directed against the toxin. Getting the disease does not cause immunity as although the amount of toxin is sufficient to cause devastating disease, it is not enough to trigger a strong immune response. The vaccination leads to immunity because a much higher dose of a harmless form of the toxin is given. Vaccination cannot cause the disease, but leads to immunity if exposed in the future. Once the toxin has taken hold, and symptoms occur, it is too late to immunise. Tetanus is a disease caused by a toxin released by a bacteria, but it is not contagious between individuals. The current low levels of incidence reflect high immunisation rates, rather than a reduction in the presence of the bacteria in the environment. In other words, the risk of disease if not immunised remains as high as it ever has been. There has been a significant reduction in people dying from tetanus in recent times, but this is because most people are vaccinated, and if people do get it modern intensive care management can keep them alive whilst the disease runs its course. However, the pain and anguish that it causes even in those who survive cannot be overestimated. In 2011, worldwide, there were 72,600 estimated deaths in children under 5 years old. Anyone who wants to protect themselves against tetanus can talk to their doctor about getting immunised. anyone who did not have tetanus vaccines during childhood. People under 20 years old, refugees and other humanitarian entrants of any age, can get tetanus vaccines for free under the NIP. This is if they did not receive the vaccines in childhood. This is called catch-up vaccination. Tetanus immunization is very effective. 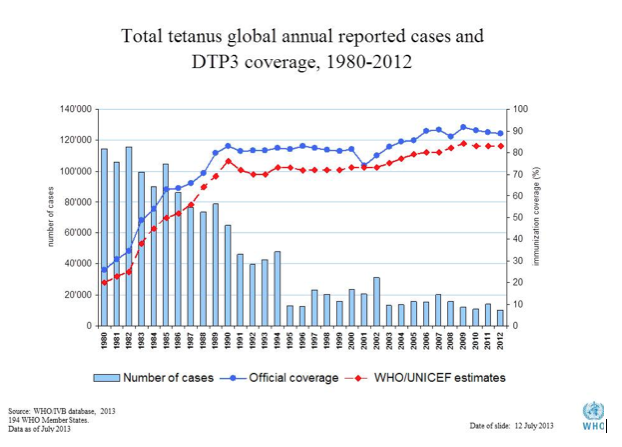 Epidemiological studies (studies of whole populations) show that most cases of tetanus occur among people who are unvaccinated or inadequately vaccinated (adequate vaccination status being defined as having at least 3 doses of a tetanus toxoid vaccine). Surveillance data from 2001-2008 from the USA showed that 97% of cases occurred in patients with inadequate or unknown immunization status. There is also serological evidence for its effectiveness (serology refers to blood tests that demonstrate immunity). Ruben et al. found that 98.7 percent of children six months to two years of age who received two doses of DTP two months apart had protective levels of tetanus antibody, whilst Myers et al. looked at patients over 6 years old, and found that after the second immunization with tetanus toxoid, 100 percent had protective levels. 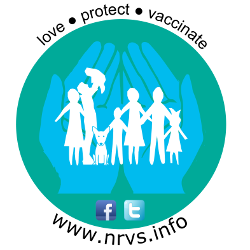 Adverse events to any vaccination can and do occur. However, these are usually very minor, or extremely rare. Mild discomfort or pain at the injection site persisting for up to a few days is common. Uncommon general adverse events include headache, lethargy, malaise, myalgia (muscle aches) and fever. Anaphylaxis (severe allergy), urticaria (itch) and peripheral neuropathy occur very rarely. Brachial neuritis (inflammation of a nerve in the arm, causing weakness or numbness) has been described following the administration of tetanus toxoid-containing vaccines, with an estimated excess risk of approximately 0.5–1 in 100 000 doses in adults. Here is a graph of data from the World Health Organisation showing how, as vaccination rates go up, the incidence of disease goes down ie the vaccination works, really well.